Do you wanna build a snowman? Course you do. SnowPi, the GPIO snowman for Raspberry Pi. This prototype shows how he’s likely to look once you’ve soldered him together. 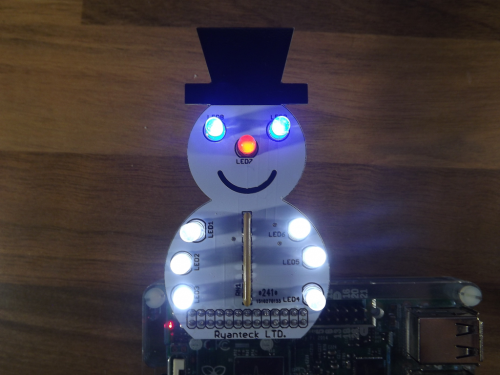 SnowPi the GPIO snowman is a fun way for beginners to learn to solder and get into physical computing with Raspberry Pi. He comes as a kit for you to solder yourself, with two crystal blue LEDs for his eyes, six crystal white LEDs for his body, and an orange diffused LED for his adorable carroty nose. You’ll also solder a right-angled header to allow you to attach SnowPi to your Raspberry Pi’s GPIO pins such that he stands up, and and resistors to limit the current to his LEDs and protect them from damage. If you’ve never soldered before, now is a great time to learn! It’s easier than you think. Why not learn to solder with Carrie Anne? SnowPi has no complex circuitry – he just provides a fun way to connect LEDs to the GPIO pins of your Raspberry Pi. This means you can write code for him in any language that can control Raspberry Pi’s GPIO, such as Scratch or Python. SnowPi’s Indiegogo campaign promises an online guide to programming SnowPi with GPIO Zero, a new Python library designed to make it as easy as possible for beginners to get started with controlling things connected to the GPIO pins. UK hobby electronics company Ryanteck is hoping to ship the first 150 SnowPis in time for Christmas, and while they’re too experienced with electronics prototyping and production to make that into a guarantee, they have shipped all their previous crowdfunded products on time or early. We think this is a great little physical computing project at a pocket-money price. If you like the look of it too, you’ve got a week left to back SnowPi on Indiegogo! Another great idea from Ryan. I got my GPIO Xmas tree from PocketMoneyTronics last year and had fun soldering with my son Ethan. Reckon this’ll be just the kit for us for Christmas 2015. Will see about getting the 10 pack kit for some December soldering fun at our new Cour_Tech_Zone lab. Nice to see it’s already funded too. Well done Ryantech.